Woods are even too dry at Kamiak Butte in Washington State. Radio is full of news about San Diego wildfires. Too many people living in semi urban / semi rural environments where there's lots of flammable vegetation. It's better to live in denser urban environments. Then visit the woods without trying to live there. They don't even allow people into Kamiak Butte County Park, near Pullman, WA. in late summer. 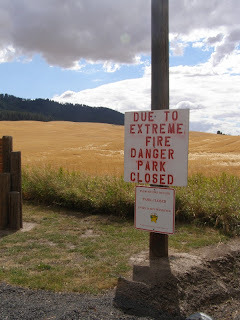 Closed due to fire danger. Recently, it seems like it's always been closed in late August. Opens again by October. They are trying to protect it. They don't want people "loving the woods to death." It's better to embrace the city. Then visit the woods carefully. Let the woods be the woods. New suburbs should be built like "new urbanism." Greater density and less flammable environments. Also shorter commutes. Speaking of commutes, global warming is a factor. It seems like the entire western part of USA is having drought years more frequently. The southeast is having drought also, but drought just seems to be getting more persistent in the west as the years go by. Are dry climates of northwest Mexico creeping north? Behind your tailpipes? The rural fringe is kind of "fake nature" anyway. Some say they love seeing Bambie the deer in their yards, but deer are a sign of "stressed environment." I hear this interesting point from a friend of mine who is an environmental scientist. Deer are not a sign of living in a healthy environment. Bambie flourishes in the "stressed transitional environments" of the urban fringe. Deer are not as common in the real woods since they have natural predators. When you see lots of deer, you are probably living in suburbia. Somewhat low density suburbia. That's what deer like. Natural vegetation is often more flammable than things like imported ornamental plantings. If you're going to build your house anyway, might as well select non flammable vegetation. It's not really a pristine environment anyway. Live in an urban setting and then enjoy the woods in the park, along the trail and on your time off. Be careful, don't go to the woods if it's too much of a tinderbox; especially if you smoke. Remember smokers, car drivers, house builders, arsonists and all who come along for the ride with encroaching civilization. Urban environments can be less flammable.